Where do I use my P&O Cruises voucher code? 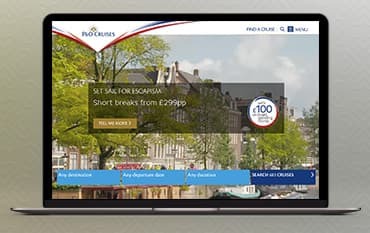 Copy a code from us and follow our link to the P&O Cruises website. You can then continue with the booking process with your savings applied. "Enjoy great savings in the deals section." "Low 5% deposits available on selected holidays." With a large range of cruise ships, destinations and packages available you are guaranteed a great holiday that ticks all your boxes whilst cruising in style. With everything from a 2-night Short Break cruise to a full World Cruise, around Norway and Iceland to Caribbean cruises taking in Florida and even Mexico you are spoilt for choice. They also have cruises around the Canary island, Australia & Baltic cruises too. Simply choose from value tours to luxury trips of a lifetime to suit your budget. P&O Cruises also have great food from chefs like Marco Pierre White & James Martin, as well as fabulous entertainment on board so set sail on the holiday of a lifetime and save some money with one of our codes. Another popular option for couples nowadays is to get married & combine a cruise holiday for their honeymoon. P&O Cruises caters for this too with their ceremony at sea in one of P&O Cruises ceremonial suites; the Captain's Lounge on the Oceana, the Ivory Suite on the Azura & the Uganda Room on the Aurora to name but a few. P&O Cruises offer a variety of different cruise packages for your enjoyment. Find a variety of cruises that provide you with the rest and relaxation you deserve, or that take you to a series of tours seeing different tourist locations, and even educational and discovery cruises. P&O Cruises offer British travellers luxury cruise holidays to the Far East, to New England, to the Caribbean, the Mediterranean and more, with a choice of fly-cruises too for the utmost comfort and convenience. With 584 cruises to search and choose from your guaranteed to find the best one for you in your most ideal location, with all the facilities on board that you need, at a budget that fits your perfectly. Cruise the world over with superb P&O World Cruises. Discover the fleet of ships that'll take you to some of the most beautiful and exciting corners of the world as you drift along the waves enjoying life on board and off. Head out on your world cruise on the Arcadia, the Aurora or the Oriana and find your bliss with all the facilities and comforts of home right a board your vessel. Your world odyssey will take you to breathtaking destinations across the globe where you can sail under San Francisco's Golden Gate Bridge, or through the might Panama Canal - experiences only cruises makes possible. For some a cruise can mean a hefty price tag, but P&O don't want anyone to miss out. That is why they offer excellent monthly deals and discounts to help you save money on your cruise booking. P&O pick out the most affordable destinations and the cheapest times of the year to sail to each location across the globe. This way they can offer you the best possible price on every destination they sail to. As well as finding great prices, P&O also reduce the costs of their cruises frequently and provide great deals to help you get the most out of your money. Browse our P&O deals page to find all the best P&O Cruises deals all in one place. Do P&O Cruises provide drink packages? Drink packages are available to purchase on board through the beverage team. Guests who have already purchased their cards in advance will have their package honoured, no matter the date of their course. Yes P&O Cruises do offer vegan/vegetarian wines on board their ships, please view the Wine List to see what these are. Vaccination requirements vary by destination and change from time to time. It's recommended that you seek advice from your medical practitioner or travel medicine clinic, at least six weeks before your cruise, to discuss your personal travel plans and obtain appropriate advice and vaccinations prior to travel. P&O Cruises have over 500 cruises available & are the cruise specialist. With a P&O Cruises voucher code, you can also get a great saving on your next cruise. So whether you want to explore Europe’s cosmopolitan capitals or the Caribbean’s idyllic islands? The breathtakingly beautiful Norwegian Fjords or the inviting Iberian Coast, you can save money with NetVoucherCodes. We are constantly on the hunt for Discount Codes for P&O Cruises to help you with your money saving. Our experts check dozens of sites for secret codes including NHS discounts, student sites & social media channels saving you time & money!